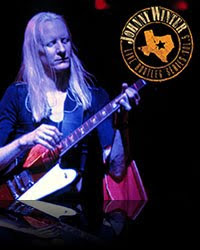 Tejas Firebird: Lennie Jones is a musician and folk artist whose blues run deep. Witness the many remarkable, evocative paintings that wonderfully capture the essence and passion of the music. 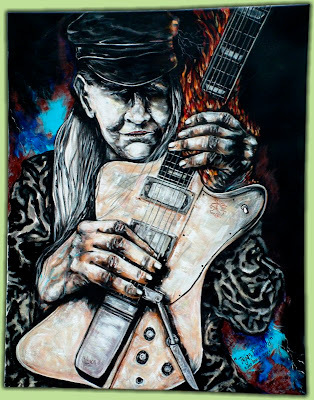 Lennie, who is based in Naples, Florida, is responsible for dozens of creations featuring some of the blues' biggest legends, and he was kind enough to share a scan of his "Tejas Firebird" with readers of JohnnyWinter.net. Thanks, Lennie! More classic Johnny: Johnny's acclaimed Live Bootleg Series rolls on with Volumes 4 and 5, the latest installments in the artist-approved series from Friday Music. Volume 4 finds Johnny tackling classics like "Okie Dokie Stomp" and delivering an acoustic reading of "Rollin' and Tumblin'." Volume 5 continues the celebration of Johnny's fretboard mastery and features "Rock and Roll Hoochie Koo." Johnny on tour: Click here to see the latest concert schedule. January is Winter time in New York City! On the road: Johnny has two dates left in 2009: He'll play the Tupelo Music Hall in Salisbury, Mass. on Friday, Dec. 18. And he'll appear at the Narrows Center for the Arts in Fall River (with Joe Moss opening) the next night, Saturday, Dec. 19. January dates include The Stone Pony in Asbury Park, N.J. (Friday, Jan. 8); Toad's Place in New Haven, Conn. (Saturday, Jan. 9); Showcase Live in Foxboro, Mass. (Thursday, Jan. 14); Mechanics Hall in Worcester, Mass. (Friday, Jan. 15); and Merrill Auditorium at City Hall in Portland, Maine (Saturday, Jan. 16). For a complete list of all of Johnny's current tour dates, click here. Johnny on JamBase.com: If you missed the site's fantastic interview with Johnny from November, you can check it out right here.